00:02:54 <mikeal> where do they go? 00:10:33 <SubStack> mikeal: is that the most recent version of everything? 01:10:38 <LOUDBOT> ALSO WE MOVED A SITE TO A NEW DATACENTER TODAY. GUESS WHAT THE TTL IS ON THE HOSTNAME FOR THE SITE. 01:12:17 <SubStack> 70 shirts sold woo! 01:13:08 <SubStack> at 73 there's supposed to be some kind of price break where I make more money I guess? 01:15:14 <SubStack> mikeal: did you find out what was wrong? 02:02:32 <SubStack> dak1n1: yep! in fact the npm maintainer isaacs is right here in this channel! 02:11:14 <dak1n1> yeah. Unfortunately I'm not doing any prod stuff at the moment.. I'm just a simple test monkey. 02:12:04 <SubStack> contract work or something salary? 02:16:45 <SubStack> but that's it! 02:19:03 <dak1n1> so.. I could use this to install and configure packages on remote machines, yeah? 02:22:56 <SubStack> then all your installations would be versioned according to your repo versioning! 02:24:09 <dak1n1> so the git repo would contain a package installation script + configs? Then drones go set it up for me? 02:25:09 <dak1n1> I guess I was thinking of "configuration management tool" when I read "continuous deployment"... I was off. I dont know much about programmer-type things like that. 14:38:31 <wiwillia> SubStack and it's all in the works now! 16:52:21 <pkrumins> see hacker news discussions for an answer! 19:44:19 <pkrumins> my latest article is at 26,000 views in 3hrs. 19:45:07 <pkrumins> and over 200 pts on hacker news! 21:28:38 <pkrumins> 32,000 visitors to catonmat! 21:55:59 <wiwillia> what's driving in the traffic? 21:56:34 <pkrumins> wiwillia, hacker news, osnews, reddit, and twitter! 22:02:13 <wiwillia> SubStack: do it! monetize those visits. 22:04:43 <pkrumins> no keys are white. 22:04:46 <pkrumins> so black shirt, white keys. 22:04:59 <pkrumins> let's do this quick!! 22:05:44 <wiwillia> pkrumins just the 4 keys? 22:09:39 <pkrumins> now we have a race condition! 22:14:13 <pkrumins> q about tipping point - what happens if it's reached quicker than deadline? 22:16:52 <pkrumins> title: hjkl vim t-shirt? 22:17:36 <pkrumins> so unicode arrows? 22:18:58 <chapel> maybe bigger keys? 22:20:53 <wiwillia> can you tell I'm not a vim man? 22:26:57 <pkrumins> let's change the title to just "hjkl vim t-shirt"
22:32:50 <pkrumins> Bill Joy wore this t-shirt when he created vi. Now you can too. 22:33:50 <pkrumins> SubStack: how is progress going with the drawing? 22:35:25 <chapel> The original way to code, as Bill Joy intended. 22:35:30 <pkrumins> should the descr be funny or descriptive or how? 22:36:52 <pkrumins> SubStack: awesome, carry on! 22:38:22 <pkrumins> bill joy took arrow in the knee. 22:42:41 <pkrumins> Description: Bill Joy took arrow in the knee in early career. Ever since then he used hjkl as arrow keys. If you don't want to take arrow in the knee get this t-shirt! 22:43:09 <pkrumins> Description: Bill Joy took arrow in the knee in early career. Ever since then he used hjkl as arrow keys. If you don't want to take arrow in the knee, get this t-shirt now! 22:46:14 <pkrumins> Description: Everyone who uses vim will know what this shirt means. 22:46:33 <pkrumins> Description: Want to troll emacs users. 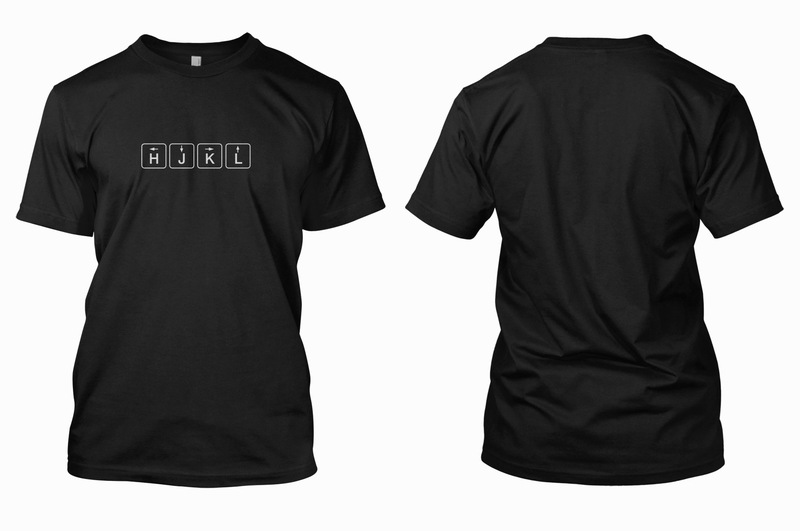 Get this shirt and go to emacs conf. 22:46:55 <pkrumins> Description: Emacs too much? Learn vim! 22:47:17 <pkrumins> Description: Borat uses vim for devops. So should you. 22:50:32 <wiwillia> you want that brown? 22:50:34 <wiwillia> or the black? 22:51:01 <pkrumins> wiwillia: can you convert bg to black easily? 23:00:23 <chapel> which is who's? 23:03:38 <wiwillia> aight, SubStack, you on that or should I try and do it? 23:09:41 <pkrumins> Bill Joy doesn't use arrow keys. He uses HJKL. Following in the footsteps of greatness, we put HJKL on this beautiful, limited edition t-shirt. Bonus: Great for trolling emacs users. 23:11:58 <prsn> that would be nice..
23:13:08 <pkrumins> SubStack: why would a tshirt company need that? 23:13:15 <SubStack> because it's awesome! 23:13:38 <pkrumins> not for a tshirt company! 23:14:37 <pkrumins> ready to push it out to 100 visitors per min. 23:14:45 <tm604> pkrumins: what, you mean your tshirts *don't* have built-in http servers? 23:17:27 <prsn> should "Vi" really be caplitalized? 23:18:24 <chapel> wiwillia: think I could get a 5x version again? 23:18:46 <chapel> whats your email? 23:20:02 <wiwillia> should I comment it on the proggit/hn posts? 23:24:47 <pkrumins> and get a shirt! 23:24:49 <prsn> 18:24 < niftylettuce> bahhh nice! 23:25:44 <pkrumins> Successfully pinged Google. Response: Thanks for the ping. 23:26:22 <ryan_stevens> pkrumins: those shirts are great! 23:26:28 <niftylettuce> i might be poor, but at least I have some cool shirts! 23:29:00 <niftylettuce> wiwillia: are you behind teespring? 23:29:02 <chapel> whats my cut? 23:29:13 <SubStack> ryan_stevens: I know right? 23:29:38 <chapel> wiwillia: did you get my oakjs shirt sorted? 23:29:46 <wiwillia> on its way to the printer now. 23:31:36 <wiwillia> who likes paying for things up front? 23:39:39 <wiwillia> pkrumins when Browserling is as big as Airbnb - are you going to tell people how you self-funded through Teespring?! 23:42:58 <pkrumins> wiwillia: if I want to cc teespring, should I then use @teespring_? 23:45:26 <pkrumins> what does that mean? 23:45:33 <pkrumins> can we increase the goal? 23:45:49 <wiwillia> but its nice to add an update saying "keep buying"
23:45:52 <pkrumins> oh yeah defs. 23:46:17 <wiwillia> UPDATE: We reached our goal in under an hour! Now let's see how much we can beat it by! 23:46:23 <pkrumins> can we set another campaign up then and keep setting the up all the time? 23:46:51 <wiwillia> talking to yourself again eh!? 23:48:24 <chapel> wiwillia: why not have a feature that lets the shirt keep selling indefinitely? 23:48:39 <chapel> or just be continuous? 23:49:00 <chapel> or is it due to cost of doing individual ones, and its cheaper to do bulk ones? 23:51:46 <wiwillia> chapel what was that for?! 23:55:57 <ryan_stevens> has chapel exposed a diabolical plot to steal fractions of a penny? 23:56:58 <wiwillia> hmmm it should have figured it out - are you sure? 23:57:09 <ryan_stevens> true story, I used to write core software to run banks and credit unions. The fist thing i did when I checked out the code base on my first day is to find where all the fractions of the pennies go. I wasn't going to steal them, but I like having the "option" to steal them.